Risotto is a staple of Northern Italian cookery using arborio rice (this is a must- thank you to our Italian friends for pointing that out). From a simple basis there are endless varieties. Andrew: This is very labour intensive, but quite simple. A dreamy and filling meal. Dawn: It sounds it! Love tomatoes! Andrew: You need to follow each step carefully. Dawn: I will crack on with the tomato sauce! 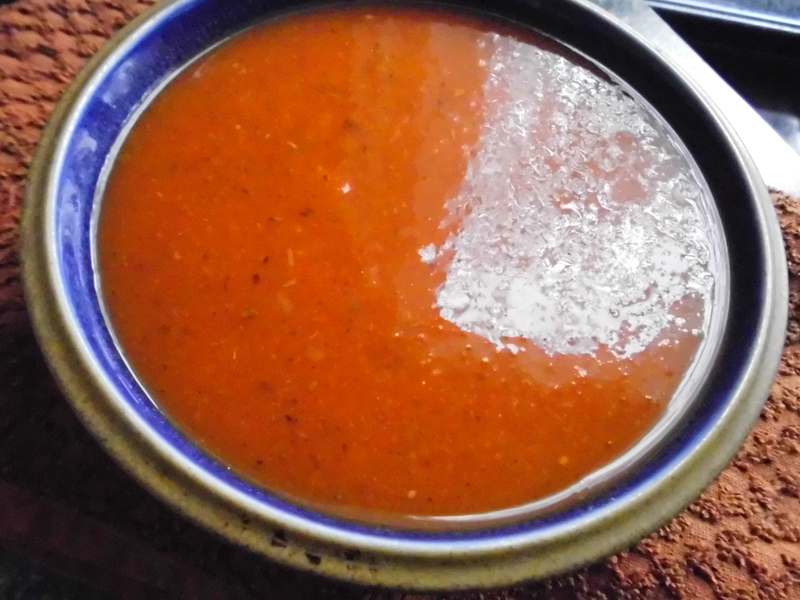 To make the tomato sauce, gently fry the two cloves of garlic in a little olive oil, then add the tinned tomatoes and first set of torn basil leaves,cooking for 15 minutes so the sauce thickens and turns a deep shade of red. Leave aside when cooked. Meanwhile leave the halved baby plum tomatoes marinating in the pesto sauce and a drizzle of olive oil. In a large frying pan, melt half of the butter and add a drizzle of olive oil over a medium heat. Fry the onion and garlic for 5 minutes until softened, then add the rice and stir until all the grains are coated in the melted butter. Add the thyme then the wine, and keep stirring until absorbed. Add the tomato sauce, stirring so well mixed. Turn the heat to a simmer. This is the laborious part. You need to add the chicken stock ladle by ladle, stirring as it absorbs, and not letting it stick to the pan. This process will take 20-25 minutes. Taste the rice to ensure it is cooked.This will happen ‘suddenly’! 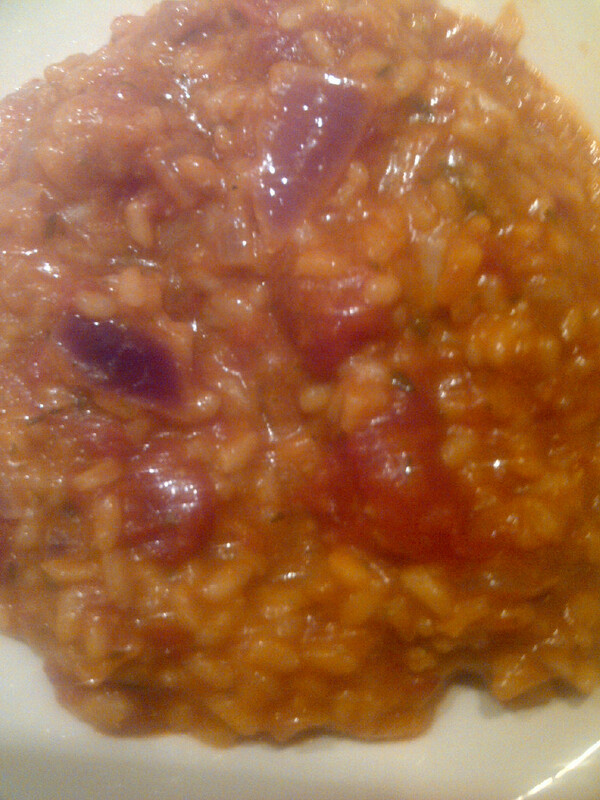 When the rice is cooked, stir in the marinated tomatoes, the remaining butter and the parmesan. Serve immediately with salad of your choice. Andrew: It is. A little hard work but worth it. In the next few weeks we will be promoting other risotto recipes. Join in the fun at https://forfoodlovers.wordpress.com and the Twitter feed @Love_Food_UK and please like us on Facebook if you enjoy our recipes. Thank you! Another simple and easy side dish that works well with stews, casseroles and roasts. Dawn: This makes a nice alternative potato dish to accompany a traditional Sunday roast. Andrew: Yes, there are many varieties of potatoes and all are so versatile when cooking. Dawn: There is that old saying: “Variety is the spice of life”! And our food needs to be varied to provide us with all the nutrition our bodies demand. That’s an excellent point, Andrew. There are over 80 varieties in the UK that are grown commercially and being from the carbohydrate family, provide a valuable source of energy which our bodies need. Put the butter in a large frying pan and melt; then, add the onion and garlic cooking for a few minutes until softened. Set aside in a dish. 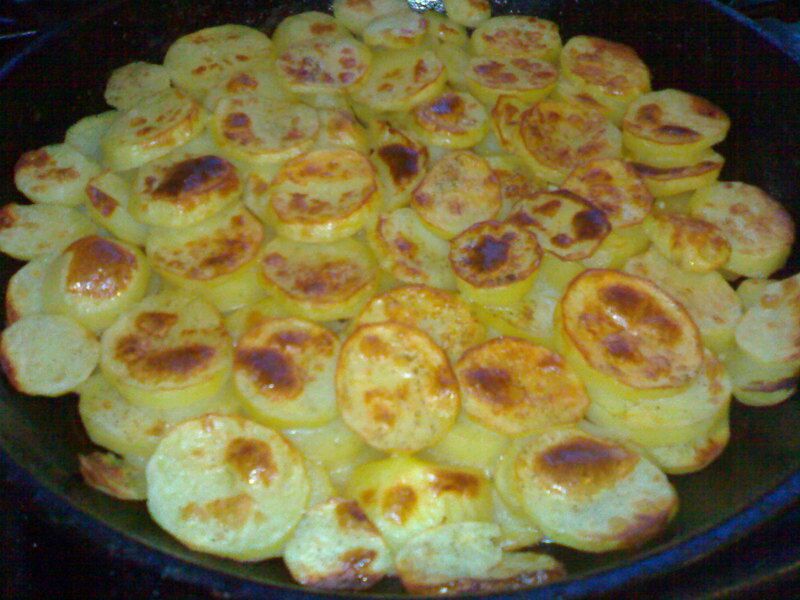 Next, place the potatoes in the frying pan using the juices from the onion. Layer the potatoes. As you do this, add a little of the softened onion and garlic to each layer, evenly scattering the mixture upon each layer. Pour over the vegetable stock over the potatoes making sure all have been covered with the stock. Andrew: Can I use a creamy white sauce instead? Dawn: Yes, that would make a delicious alternative to this healthier version. Andrew: In fact, a super quick version of this dish could be made using a tin of chicken soup rather than vegetable stock. Add the grated cheese to the top of the dish. Season with salt and pepper. Cover the ovenproof dish with kitchen foil. Place in a pre-heated oven at gas mark 6, 200°C electric for 1 hour. Then, remove the kitchen foil and cook for a further 20-30 minutes while the top browns. Test to see if the potatoes are cooked by sticking a fork into them and if tender, they’re cooked. For more of the Cooking Duo’s easy, tasty and inexpensive recipes and cooking tips, follow this blog and Twitter account @Love_Food_UK.